All listings on this page are alphabetized. We visited or participated in all the activities listed on this page. 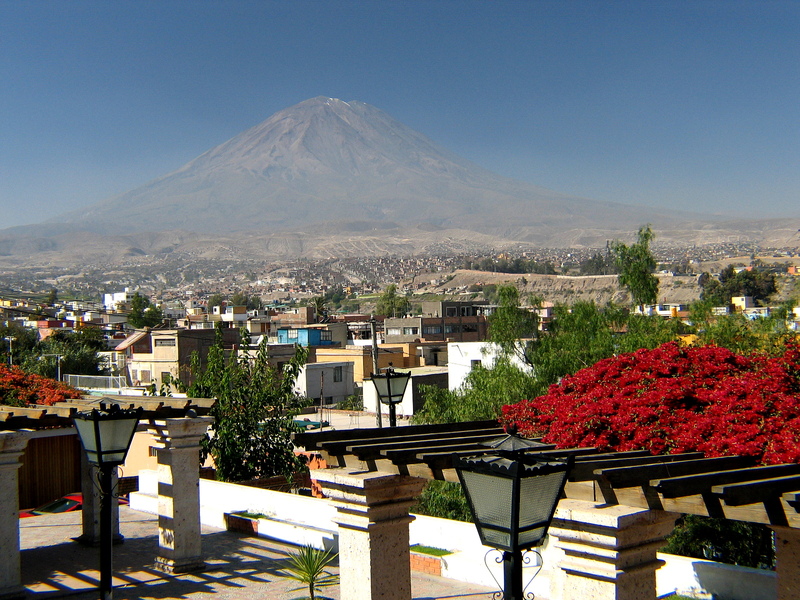 El Misti – towers above Arequipa at 5,822 M or 19,101 feet. You can’t miss it; it dominates the skyline of this town! There are several options for hiking in its vicinity or climbing to the top. 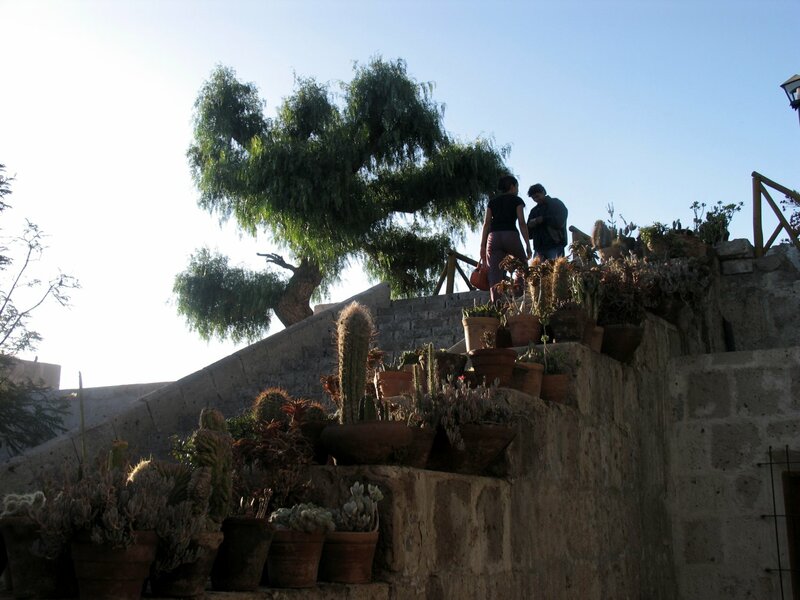 See our Agency section for a list of agencies that typically offer climbs of El Misti. A normal climb is 2 to 3 days. 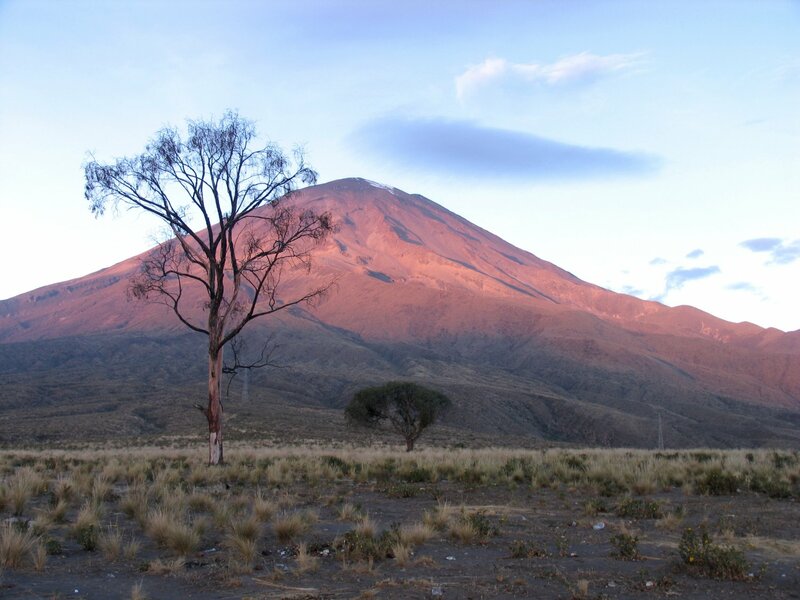 A great acclimatization hike is the trail to Tres Arboles or the “three trees”. This hike round trip will take from 5 to 7 hours. The Tres Arboles are at about 11,000 feet. 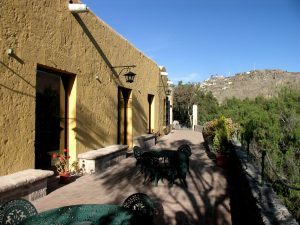 In order to get to these you have to drive towards El Misti and then park or have the Taxi driver drop you off as close to the trail to the Tres Arboles as possible. 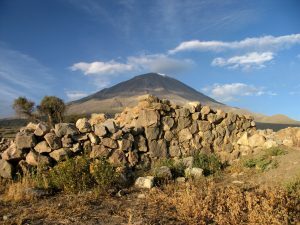 There are actually several trails to get to this area – one of the trails goes right through the main garbage dump for this side of Arequipa. It is huge, there will be bad smells, and probably part of it will be burning. There are people who also live in this area. 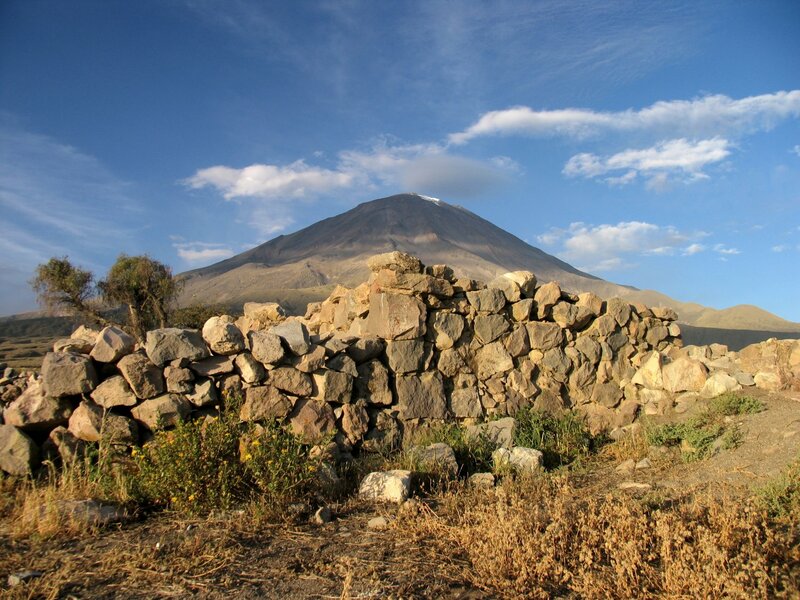 The once you leave the garbage dump there will be no more homes and its just you, the trail and the outdoors and great views of El Misti and also looking back at Arequipa. The Tres Arboles have in fact spread and are now probably 20 to 30 Eucalyptus trees growing on a plateau at the base of the side of El Misti. There is a small altar here with many candles and its common for hikers to light these candles when they arrive. Each year there is a large parade of people that makes a daily pilgrimage to this spot to pray. Its best to start this hike in the morning as you don’t want to hike back at night as parts of the neighborhoods near the trash dump are a bit dodgy. 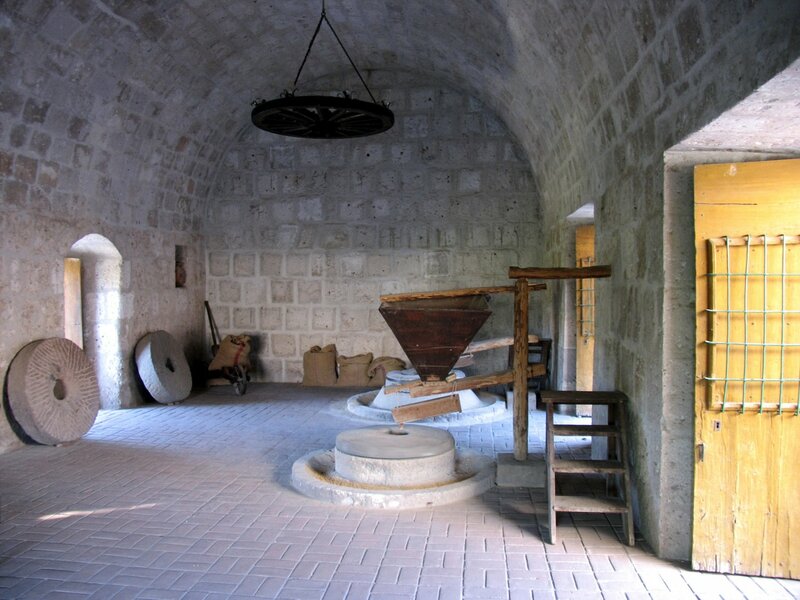 El Molino is a site founded in 1785 located about 20 minutes from the center of town. 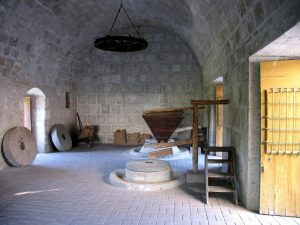 This location originally used water to power sillar stone wheels to grind wheat. Essentially this area was a large mill. For reference, sillar is the very white stone that much of the buildings in Arequipa are constructed of. Today you can see a small river that runs through the property, the grinding stones and how the power of water is used in the grinding process. The entrance fee is approximately 7 soles. An added bonus is the horse riding which is optional. You can choose to ride from 30 minutes up to several hours. You will ride through nearby villages, across the local stream and into the hills. Typically you will have a guide riding the horse along for the ride. 30 minutes of riding starts at about 15 soles. La Mansion del Fundador is located about 30-35 minutes from the center of town. 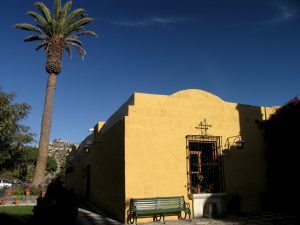 This mansion was originally the colonial founder of Arequipa’s home and its set in a lush green side valley away from the main part of Arequipa. The valley floor is well irrigated and quite green, but the side hills are very dry like the rest of the area surrounding Arequipa. This makes a nice visual contrast. As of press time, the entrance fee is 10 soles. This mansion dates from the mid 1500’s and by the late 1970’s the property was in a total state of disrepair. A local organization purchased the property and totally renovated it. Today its a beautiful building with nice gardens. You can spend up to an hour here. 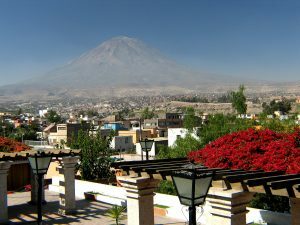 Mirador de Carmen Alto is a lookout over what is probably the most green area of Arequipa. Great views of the River Chili and all the nearby green terraced fields. Also El Misti looms in the background. Often tour groups will stop here as its a great photo spot. Admission is free. There are some llamas on site and you can pet them and take photos with them as well. 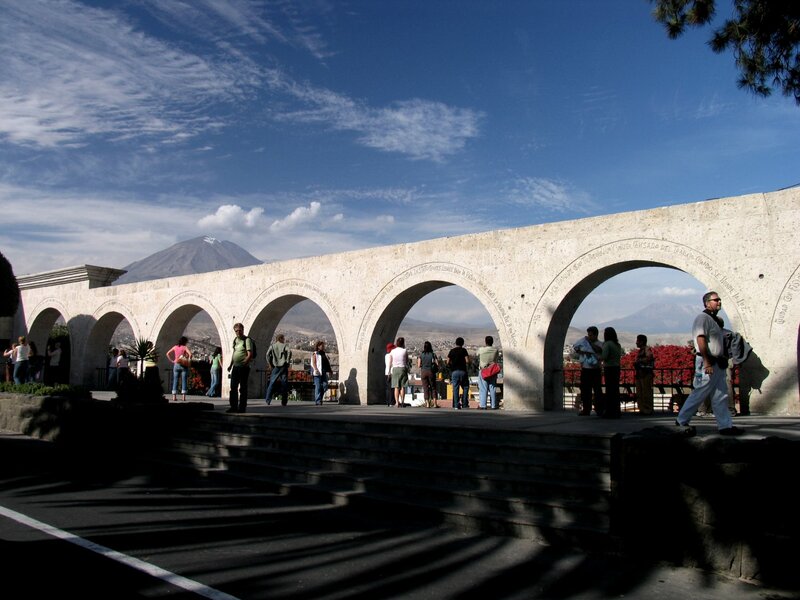 Mirador de Yanahuara is a lookout over the city of Arequipa in the district of Yanahuara. This is well worth a visit and its free. 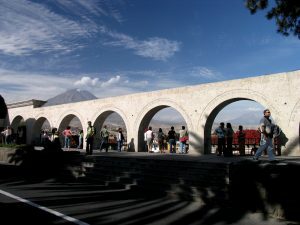 The classic wide angle pictures of Arequipa framed by the arches made of sillar are taken here. Lots of wedding receptions are held here and you may also see a few tour buses in the area. Great views of El Misti. This is where you will want someone to take a picture of you if you have a camera! Two good restaurants in the area are El Cebillano and Sol De Mayo. See our Restaurant Page for more info. Mirador de Sachaca is tower on the highest hill in the city of Arequipa and is a great place to visit both at night and during the day. It is located in the Municipality of Sachaca. 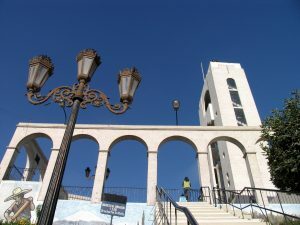 Admission is 1 sol and you can walk to the top of this tower up 5 or 6 flights of stairs. 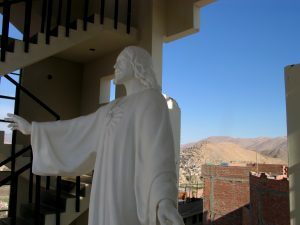 In the middle of the flights of stairs there is a white sculpture of Christ with his arms outstretched. At the top you are rewarded with excellent 360 degree views of the city. Sometimes vendors will be hanging around the parking lot. If you like ice cream try Arequipa’s Cheese Ice cream – often there is a vendor selling this in the parking lot. Nightclubs – we visited several during the week. Mistake! They aren’t very popular unless you are there on Thursday, Friday or Saturday nights and then they usually don’t start “hopping” until after 11pm. The Forum Rock Cafe is a very good nightclub – they have a lookout over the city near their dance floor. The Deja Vu is also a smaller very nice nightclub located just down the street from the Forum Rock Cafe on Francisco 319 B. They do have a 10 sole cover charge on Friday & Saturday nights. 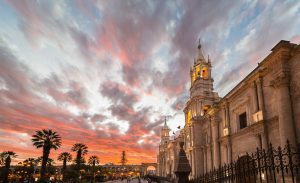 Plaza de Armas is the center of Arequipa. There are several churches and cathedrals worth visiting. One of the largest ones is the main cathedral on the east side of the Plaza de Armas. The inside is worth visiting and it is very impressive. Many of the materials inside were imported from Europe. People watching or reading a good book on a bench in Plaza de Armas is a good way to whittle away some time. Often there will be parades or marches on the streets in the Plaza de Armas and the benches fill up with people on the weekends. 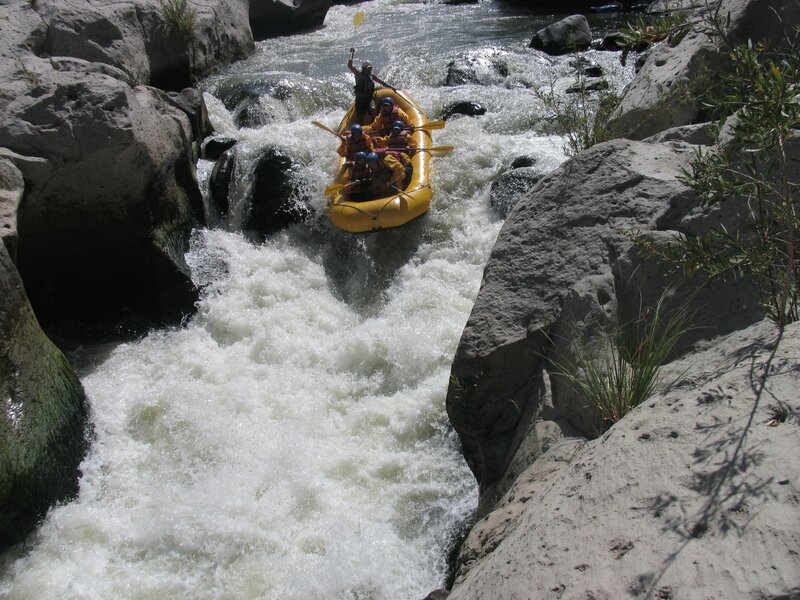 River Rafting the River Chile just above Arequipa has a good set of beginning up to class 4+ rapids. It will take about 30 to 40 minutes to get to the end of the dirt road where you will put the raft in the water. The main part of the river here takes at least an hour to raft down. There is one section you can stop at and jump off a tall rock into the middle of the river. Most of the river is surrounded by tall dirt desert like walls. 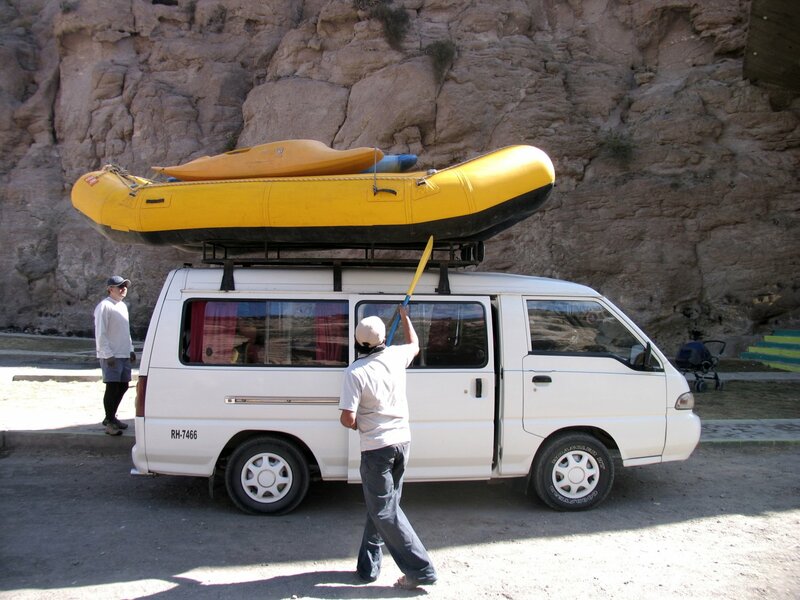 There are a select number of agencies in Arequipa that offer rafting on this section of the Chile River. We used Cusipata www.cusipata.com; they are very professional, experienced and their main focus is river rafting. 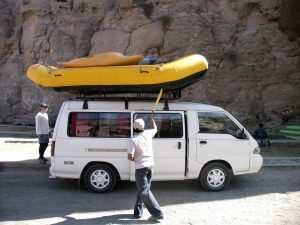 They also offer guided rafting trips on the Cotahuasi and Apurimac Rivers, but the Chile River is by far the closest trip to Arequipa. Shopping is a good way to whittle away the day in Arequipa. There are some nice shops although not as many as you would find in Cuzco. 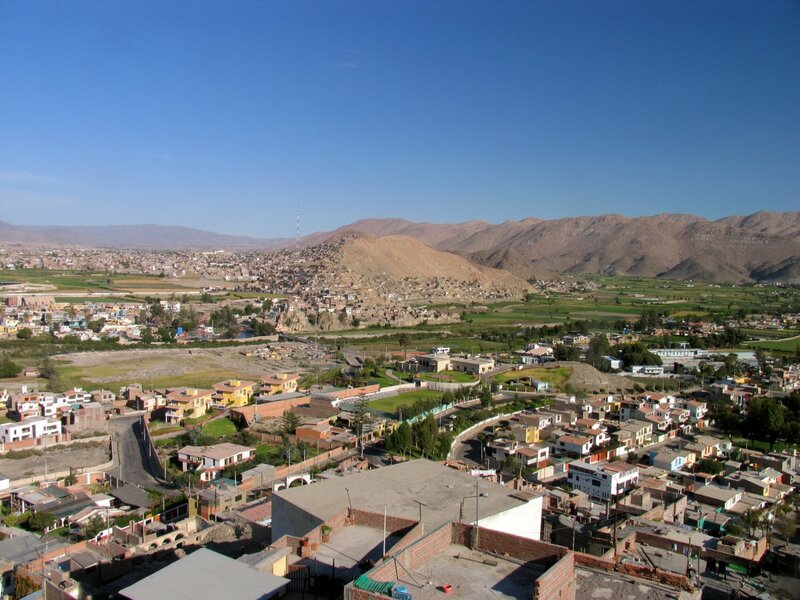 Alpaca & Vicuna clothing is very popular, in fact Arequipa is the hub of Peruvian alpaca trading. 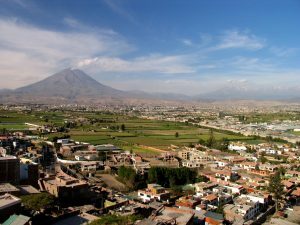 One locally well known Alpaca/Vicuna store is Alpaca 111 – they have several outlet stores in Arequipa and other Peruvian cities. Visit www.alpaca111.com for more information. Another Alpaca clothing store, IncaAlpaca is located at Condor 100 Tahuaycani near the train tracks. Several times a year they have huge sales in which they spread out their clothing onto tables separated by several pricing categories. These sales are very popular with the locals and you can find some definite bargains on alpaca sweaters. Saga Falabella is a large department store that started in Chile but they have stores all over select South American cities including Arequipa. Think Macy’s but a little bit smaller. They are a general department store, jewelry, clothing, electronics etc. In Arequipa they are located at: Av. Ejercito 793 Cayma. Phone: (054) 60-6023 Visit: www.sagafalabella.com.pe To reach their store would be a very long walk from the main part of town (Plaza de Armas), as their store is located in the more commercial section of Arequipa. Better to take a taxi to get here. There are restaurants and other small shops nearby. Patio del Ekeko is located 1/2 a block from Plaza de Armas in the northerly direction at Mercaderes 141. It is named after one of the gods of the local Tiawanacota culture. 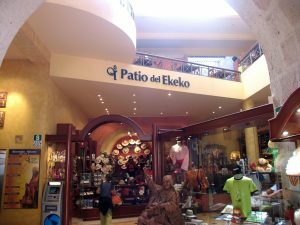 The “patio” is a collection of tourist shops spread out over 5 floors including those that sell alpaca items, silver jewelry, handicrafts, souvenirs, clothing, and Peruvian chocolate. There is also a dining option here.